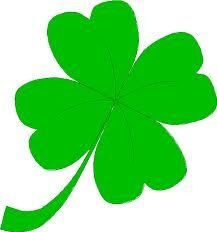 Today is St. Patrick's Day and I am feeling lucky! But since I am not Irish I wonder if its the luck of the Polish lol. I am about half Polish and I have the oddest good luck. I win stuff all the time. So far not any thing big but I feel that my luck will change. I am planning to play some scratchers and the Super Lotto today and I am going to win something!!! I just know it. But even if I do win the lotto I will still be here blogging with all of you, just with bigger prizes lol.